In a totalitarian regime a young girl experiences the brutality of politics first hand. Yet, through her memories and her fortitude perhaps the idea of personal freedom will persist. 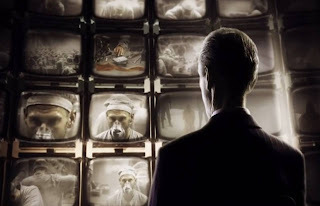 Motherland harkens back all the way to Metropolis and features stereotypic characters and motifs that are plentiful in the propaganda art of the 1920s and 1930s as well as later – Orwell’s 1984 looms large here. What is remarkable about Motherland is that it is a diploma project produced at The Institute of Animation Filmakademie Baden-Württemberg – in other words, it’s a student project. It was directed by Hannes Appell with DOP Stevo Arendt and producers Libor Tesacek and Felix Vollmar.